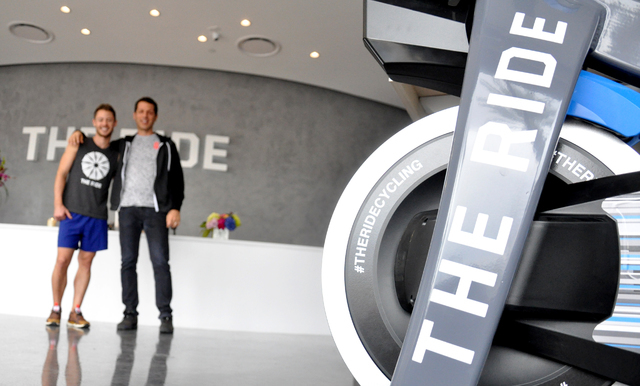 The Ride is a new indoor cycling space at 4245 S. Grand Canyon Drive in eastern Las Vegas that may benefit greatly from this marked attention to details. Courtesy Shannon McBeath is shown atop a bike used at The Ride. When it comes to understanding the value of a small business, the beauty is often in the details. That is why they can compete with corporate competitors who hold significant advantages in resources, brand recognition and mature business processes. The details lure the public to seek out these businesses. They drive entrepreneurs to take significant fiscal risk to create these spaces. There is the promise of monetary reward, of course, but the very best of them follow an even more fundamental urge: I want to make this exactly what I envision it to be. I want to do it right. 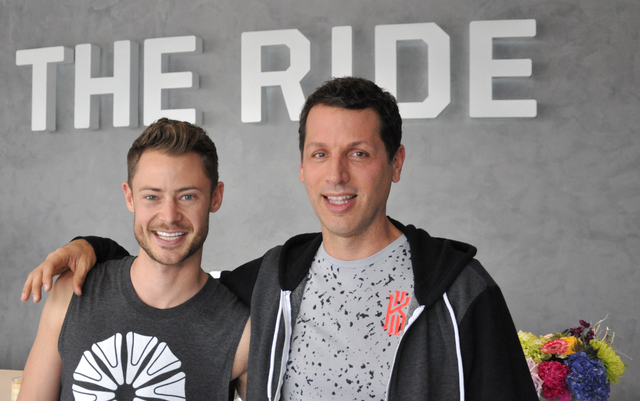 The Ride is a new indoor cycling space at 4245 S. Grand Canyon Drive in western Las Vegas that may benefit greatly from this marked attention to details. The business is the collective brainchild of Milo Miloscia, Mark Cornelsen and Shannon McBeath, who opened the facility Dec. 14. The space was chosen because of its location near Summerlin and the 215 Beltway, as well as the nearby collection of exercise and health-related businesses in the area. “I moved here from L.A. two years ago,” said Cornelsen, who worked for the past seven years in large-scale wedding production and destination event planning for companies based in New York and Los Angeles. “I got burned out from my work and started biking. It became part of my ritual, my mental clearing. It became a necessity in my life. Miloscia served for 12 years as senior vice president of the Andrew Hewitt Co., an independent concert promoter. McBeath is a former sales manager at The Mirage and serves as a foundation board member for Opportunity Village. Cornelsen said the three owners are involved in all facets of the business, from concept to facility design, equipment and retail apparel selection and day-to-day operation matters. “We think we have a really good balance between comfort and attention to detail,” Miloscia said. The product they have delivered is an exercise environment centered on the Ride Theater, an amphitheater-shaped space featuring 33 ergonomically engineered custom bikes arranged on three levels. The studio offers daily classes to fit a variety of exercise needs and preferences. 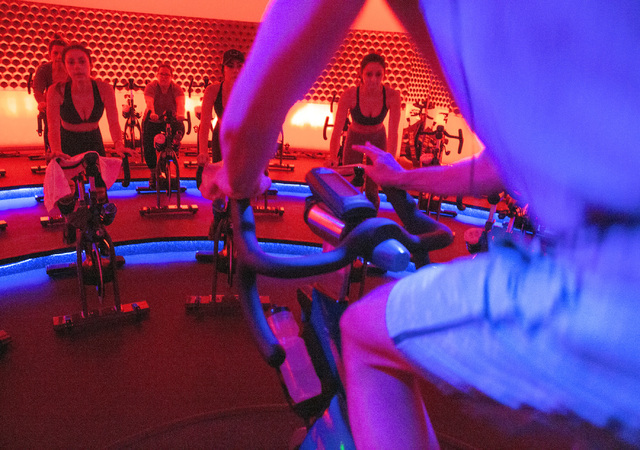 The rounded walls and multicolored LED lighting help create a workout atmosphere that is intimate and dynamic without giving any sense of confinement. The model–SC3 cycles are manufactured by the Denver-based company Stages. The trio spent much time considering which stationary cycle to purchase. The physical bikes were, of course, one key ingredient, but the owners put as much thought and research into every aspect of their business. “We started in Los Angeles, then I went to New York and oversees, visiting many, many different spinning locations,” Miloscia said. “Noting what we liked about some and what we did not like. The experience starts with the architecture and clean design of the facility. It ends with the presentation of a post-workout cold towel with essential oils, ample space to socialize, the availability of fresh pressed juices and state-of-the-art locker rooms and showers equipped with Malin and Goetz skin and hair care products. Those two pejoratives were far from McNulty’s description of her experience. The Ride owners hope to push themselves also, with expansion plans on the horizon. Miloscia said expansion targets may be upscale suburbs of major metropolitan areas rather than city centers, in places such as Los Angeles or New York. But no matter where The Ride is located, the distinctive shape of the theater will likely be incorporated into the design. 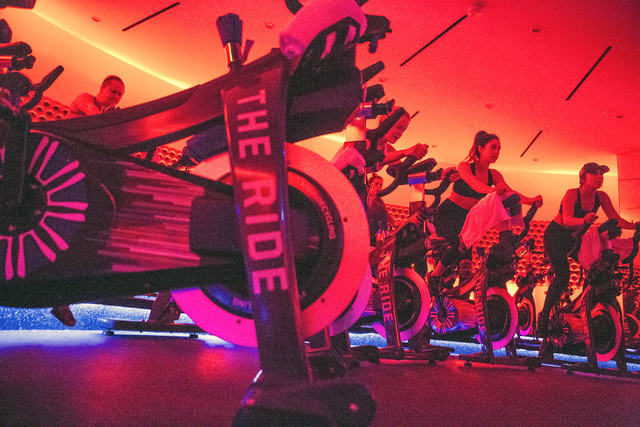 On-site and online retail sales is an area that can account for as much 25 percent of an exercise establishment’s revenue stream, and the owners of The Ride have paid as much attention to the details of their merchandise as they have with other aspects of their business. And that thought began with the business identity itself — name and logo. 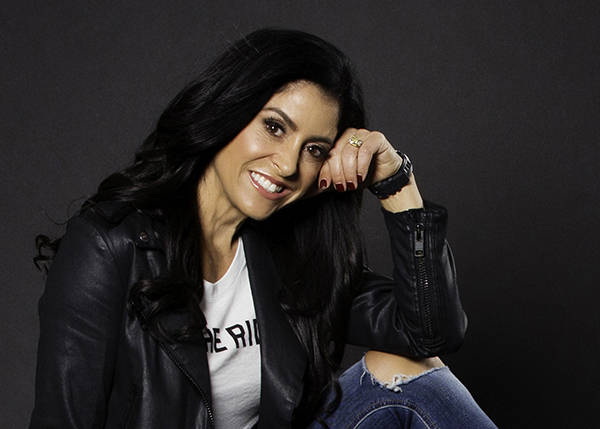 The Ride apparel comes from three companies that are part of the Active Wear apparel collective in Orange County, which specializes in high-end workout wear. “Shannon took about 20 different items, washed them, wore them, saw what held up, what did not,” Cornelsen said. “She saw what was supportive enough for women when they are on the bike. How did the pants fit? Too tight, too loose in places? Everything that we have here, Shannon owns and has worked out in. McBeath, Cornelsen and Miloscia are committed to offering a monthly charity fundraising session called The Ride Cares. Selected nonprofits are allowed to take over the space and charge class participants whatever they choose, reaping 100 percent of the proceeds. The Ride provides the instructor and markets the event throughout the month. The trio are relying largely on business marketing through networking with community partners including local nonprofits and hospitality companies, according to Cornelsen. So far the strategy seems to be paying dividends. Class attendance is growing steadily in the first weeks of operation and client feedback has been positive. And did The Ride make the novice spinner feel muscles she didn’t even know she had?